The Raheel-Nawaz regime has taken actions against MQM to give credibility to the American drafted National Action Plan. The regime has taken this action to deceive the people that the National Action Plan is not specific to those who for one reason or the other are affiliated to Islamic causes. Thus, action against MQM is not aimed at maintaining peace in Karachi by arresting criminal armed groups or American spies and assassins, rather it is to build credibility for the American war on Islam. Since the implementation of the National Action Plan began, the regime’s agencies have arrested 25,896 people on different charges and conducted 24,844 combing operations across the country. 3,906 people have been arrested by police in violation of laws on the use of loudspeakers, including 2,874 in Punjab alone. In total, 737 cases have been registered for spreading hate speech, 745 people arrested and a total of 69 shops sealed on same charges. In addition, there is a banning of entry for foreign students in Islamic Madaaris in Pakistan, as well as funding from foreign individuals or countries. These actions have provoked protest from religious parties and Ulema, who accused the regime of undertaking actions aimed against the religious people, whilst giving free hand to secular and nationalist parties with their armed gangs. On 2 March, 2015, the Ittehadul Tanzeemat-i-Madaris, an organization of the five Wifaqs (federations) of religious institutions, strongly rejected the government actions against the Islamic Madaaris. It denounced all “unconstitutional” actions of the rulers who, it alleged, are pursuing the plan of the imperial powers. It added that the government was bent upon advancing the designs of the United States and the West against Islam. It maintained that an anti-Islam plan was being pursued through harassment as well as arrests of the ulema, along with a ban on the utilization of loudspeakers of Masajid. The head of Ittehad-e-Tanzeemaat-e-Madaris complained that only the Madaaris were being focused upon and that the crackdown on the seminaries was relentless, without a break of even a single day. 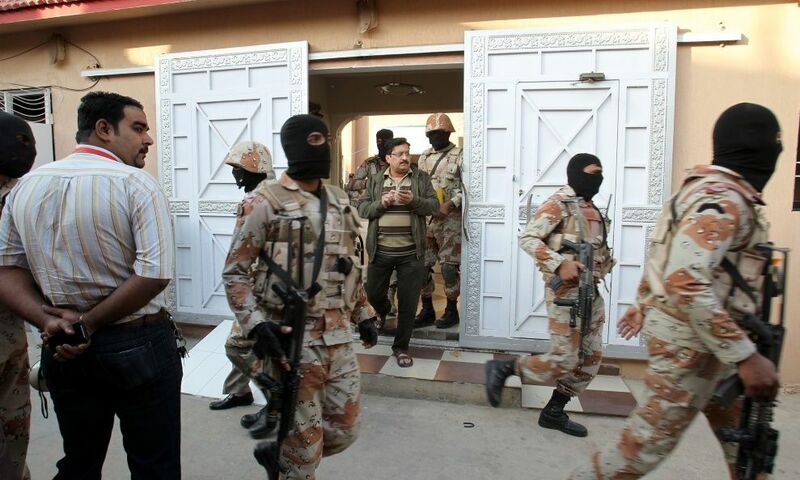 In reality, the crackdown against MQM is just an eye wash. Had the regime been sincere to the security of the people it would have closed the American consulate in Karachi which is used to incite sectarian and ethnic conflict within Karachi and far beyond it, into Baluchistan. It would have rounded up the Raymond Davis network American spies, who fund, plan and supervise bombings and assassinations that have plunged Pakistan into chaos. And it would have expelled all American officials, military and political, who are in constant contact with traitors in Pakistan's leadership, to order and forbid. If these actions would have been taken and the head of the snake of insecurity, America, had been cut off, then this regime genuinely could have earned the respect and admiration of the people. However, the traitors in the political and military leadership will never take these actions and so the people of Pakistan and this region are not going to see a lasting and permanent peace and stability under their rule. Only the Khilafah will take these necessary steps to provide security for the Muslim Lands and cleanse them of all foreign hostile presence.